When I finished reading An Awesome Book of Thanks! to my five-year-old he looked at me and said “Thanks for reading the book Mum. Thanks for giving me a hug and thanks for gravity”. That warmed my heart and this special book is guaranteed to warm yours (but I can’t take the credit for gravity, so thanks Earth). A lot has been written about author Dallas Clayton and his self-published picture book, An Awesome Book. The book is about dreaming big but when Clayton pitched his story, publishers didn’t get it. So applying what he knew (and dreaming big) Clayton made an unorthodox decision – to give away the book for free online. It was awesomely successful – people wanted a hard copy and Clayton could barely keep up with demand. He went on to establish the Awesome World Foundation which gives away one book to a school, hospital, library or organisation in need, for every one that is sold (so far it’s over 50,000). Mention must also be made of the fantastic illustrations from the fuzzy little guys that are the main characters through to pages jam-packed with colour, fine detail and feeling (check out the bloody knee on the skateboarding dude below). 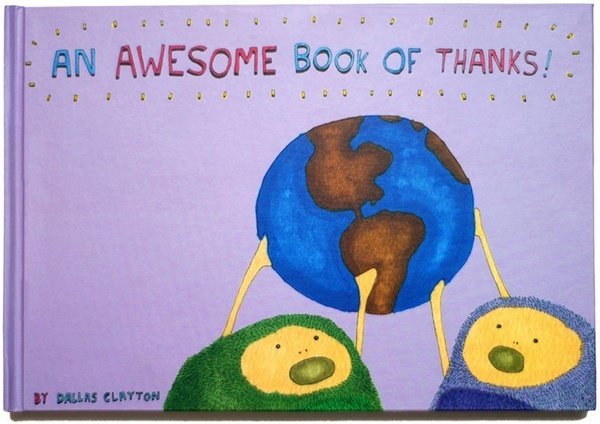 You can read An Awesome Book of Thanks! free online but truly, I think this book is simply so good that you’ll want your own. It costs US$16.95 from the Awesome World Store.